Captive Red-Eyed Tree Frog (Agalychnis callidryas) in Monteverde, Costa Rica. “The tree frog looked surprised. But with bulbous red eyes against that vivid green amphibian’s head, a look of credulous alarm is pretty much a constant. Enjoying his Sunday morning lie-in after a long night tormenting the insect life of his little corner of paradise, he was roused by a drippy hand. That would be mine. Instructed in the fine art of frog wrangling by one of the Frog Pond’s enthusiastic staff, I gently prodded my subject to life. I wasn’t asking for much really. It’s not like hundreds of his kind haven’t been poked and prodded and cajoled into an endless series of poses by other photographers through the ages. 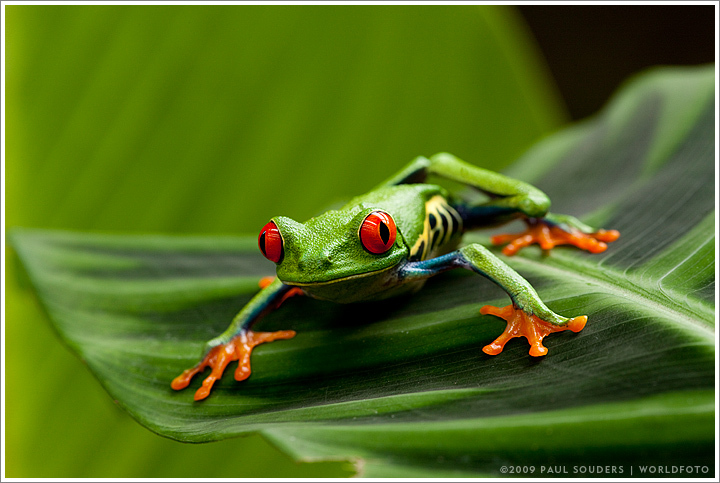 Everyone has that shot, the red-eyed green tree frog, poster child of the Costa Rica’s endangered cloud forest. Except for me. And I wasn’t leaving without it. At the local Ranario (Frogarium, give or take), I was told it wasn’t possible. I was told it might be possible, but I’d have to talk with the owners. I was told I could come in after closing time, but could only use a flashlight. I settled on showing up at seven o’clock on Sunday morning and promising leave my flash in the car. Paying the ten dollar entrance fee and subsequent heavy tipping seemed to help too. So my spanish-speaking frog wrangler unlocked the display case, we coaxed some nocturnal amphibians into grudging diurnal wakefulness, and we proceeded with what must have been an amusing multilingual pas de trois. I said something in mangled spanish. The trainer looked at me quizzically. The frog tried to crawl back to his shady leaf. The trainer gingerly picked up the frog and tried to place him in a photogenic posture. The frog leapt away. The photographer used up all his spanish apologizing for all the trouble he was causing both the trainer and frog and began talking to himself in more familiar anglicisms. It was only through a mix of friendly persuasion and nervous I’m-overstaying-my-welcome laughter, combined with Costa Rica’s unfailing politeness and the absence of any known defense against photographic obsessiveness, the morning wasn’t a total loss. I got the pictures, the frog wrangler got a generous gratuity for his trouble, and the frog finally got to go back to sleep. Photographed January 25, 2009 with a Canon EOS-1Ds III camera and 180mm f/3.5 Macro lens. Exposure 1/8 second at f/11 with ISO 400. This entry was posted on Sunday, January 25th, 2009 at 7:58 am. It is filed under On the Road and tagged with Central America, Costa Rica, Travel, Wildlife. You can follow any responses to this entry through the RSS 2.0 feed.